Following 35 knot winds yesterday, there were clear skies yet blustery conditions today as Sydney played host to the fourth International tournament of Extreme Poker suspended over the cliffs of North Head, Manly opposite the Harbour Bridge. Perched on a platform, six players faced a 90 meter vertical drop if they lost their chips. But it was only Hugo Asenjo from Sydney that was permitted to walk off the platform on to solid land as he took the title of Extreme Poker Champion. 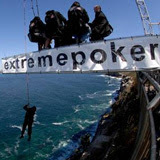 Extreme Poker’s ‘Cliff Hanger’ is not for the feint hearted! It’s all about playing poker under extreme conditions - that was hard for Mathew Horton who was first to loose all chips and to take the 90m plunge to the rocks and ocean below. Soon to follow was Cameron Stewart from Melbourne and Matt ‘The Rat’ Delbridge whose family emigrated from Cornwall, England. Donna Conlan, the only female in the game was holding on to her position but was soon literally dropped from the table leaving just Andrew Cha Cha and Hugo Asenjo. Hugo had a massive lead with 90% of the chips. Andrew Cha Cha fought back valiantly but after three hands he was dealt a vicious blow and had to take the ultimate leap.